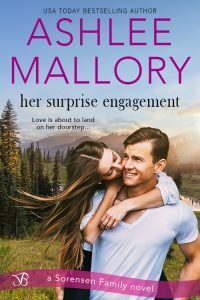 Have you picked up your copy of Her Surprise Engagement by Ashlee Mallory yet? Don’t miss this fake engagement, sweet romance! She let the sand sift through her fingers one last time and clapped her hands together to wipe them off. It might have been the nicest, most heartfelt thing anyone had ever told her, and tears she hated to shed rose in her eyes as she looked away. But Jack wasn’t having it and tilted her face back toward him. A tear must have slipped because his hand was wiping something from her cheek. How could someone she barely knew have the ability to speak so directly to her heart? Her chest quivered as she tried to catch her breath, still unable to draw her gaze from his. Sick wasn’t exactly the word that came to mind. Quite the opposite, really. She smiled, realizing for the first time that maybe, just maybe, her heart was ready to move on from Leo sooner than she thought. Single mom Daisy Sorensen doesn’t believe in fairytale endings—at least not for her. All she wants is to enjoy a much-needed, stress-free family vacation at a friend’s Lake Tahoe home. So of course everything that can go wrong does. Including a gorgeous man and his daughter showing up in the middle of the night. Soon-to-be Governor Jack Harrison has had a crazy week, but he’s sure nothing can top arriving to find a bathrobe-clad, beautiful stranger in the home he’s staying in for the week. He’s wrong. When things spiral out of control the next morning, Jack makes Daisy an offer she can’t refuse. She’ll pretend to be his fiancée and he’ll help her open the bakery she’s been dreaming about. But in between late-night campfires and days on the lake, Jack finds himself falling for the strong, stubborn woman for real. Holiday Recipes: Mocha Caramel Brownies with Stacy Wise!